Beetle Blaster is a patented trap to control populations of Small Hive Beetle (Aethina tumida). In late 2014 the Small Hive Beetles (SHB) was discovered to be well established in southern Italy. Much of Europe is now thought to be at risk of SHB invasion. 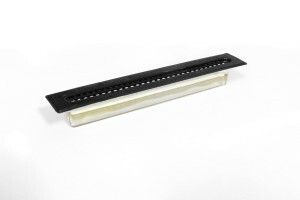 Beetle Blaster is a plastic device inserted between frames in a hive to trap Small Hive Beetles (SHB) and thereby protect healthy honeybee colonies. It also acts as a very effective sentinel device. 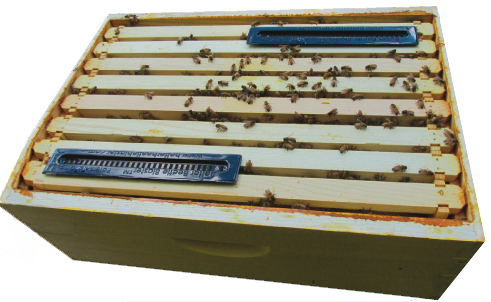 The trap, 23 cm long and 3.5 cm deep, is designed to fit neatly between outer frames in a hive. Each Beetle Blaster can contain about 25ml of vegetable oil which acts as the trapping fluid.The holes in the top of Beetle Blaster are big enough to allow SHBs to enter, but cannot be accessed by honeybees. Beetle Blaster in use. The traps are placed between the outermost frames. In sentinel hives, or with low infestation, for each colony, two Beetle Blaster traps are partly filled with about 25 ml each of food-grade oil such as corn or sunflower oil. The traps should not be completely filled to ensure that trapped SHBs cannot reach the top to climb out. 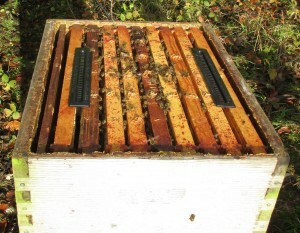 The traps are inserted between the outer frames of the top box. Insertion between the outer-most frames is best because the SHB tends to try to attack the colony and its stores at the periphery. At each normal hive management inspection, the traps are examined to see if SHB is present in the traps. If significant numbers of SHB are present, the traps can be disposed of in a safe and sensible fashion and new oil-filled ones inserted. If the traps are free or nearly free of SHB, they can continue to be used, but the oil levels should be checked and topped up if necessary. For heavily infested colonies, two Beetle Blaster traps should be placed in each brood box and super of the hive. Keeping bees healthy is essential in controlling SHB. Weak colonies are much more vulnerable. Make sure traps are not completely filled to ensure that trapped SHBs cannot climb out. The traps can be partly filled with apple cider vinegar with a layer of oil floating on top. Apple cider vinegar is a particularly attractive bait.